Humans lost the ability to see magical, wonderful things for what they really are. And it gradually starts to affect the unicorn. She is immortal, incredibly beautiful, and filled with magic. That doesn’t change based on how people see her. She’s still a unicorn no matter how many people just see a white mare. But she becomes heavier, less hopeful as she’s continually misjudged and mislabeled. Even after two people who know what she really is join her adventure the unicorn only wants to find the other unicorns and get back to her own woods. It’s exhausting to live in a world where no one can see the things that make you uniquely wonderful. Lewis is talking about the eternal potential of human beings to become children of God. How we see other people matters. What we do to other people matters. We can point them toward their true selves or we can “cage” them in something else, even with the best of intentions. And the worst thing is that if we put wrong perceptions on them, they can start seeing themselves as something other than what they truly are. That’s what happens to the unicorn. 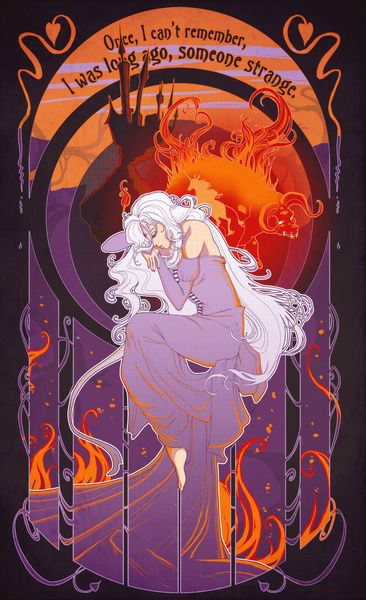 Now that the unicorn is a human called Lady Amalthea, she starts to forget she was ever a unicorn. She loses touch with her true self as she becomes more and more human. Falling in love with Prince Lír only accelerates the change. By the time his father (who’s been trapping the unicorns for himself) confronts her about her true identity she doesn’t recognize the other unicorns. She’s like the people she first met when leaving her woods — she can’t see unicorns anymore. Even in herself. The unicorn has lost the ability to see her true self, so she’s content with being something less than she was before. Her two friends aren’t just going to let her forget who she is, however, and Schmendrick turns her back into a unicorn. But even though she’s back to being herself her perspective has changed. She understands what she is and what she was. She has completed her quest and is now the only unicorn who can feel regret, but she’s also thankful for the love that resulted in her one sorrow. Once again, she can see herself for who she truly is including the character growth she experienced during her quest. Let’s suppose for a moment that we’re all unicorns. Do you know that you’re a unicorn? That is, do you recognize and nurture your unique gifts and personality, whether or not other people see it? And do you see the unicorns around you? Are you looking just at the surface of other people, or do you try to see their full and wonderful potential and encourage them toward the truest and best versions of themselves? I hope we can answer “yes” to these questions. I hope we can find, and then never let go of, the ability to see “unicorns” for what they truly are.